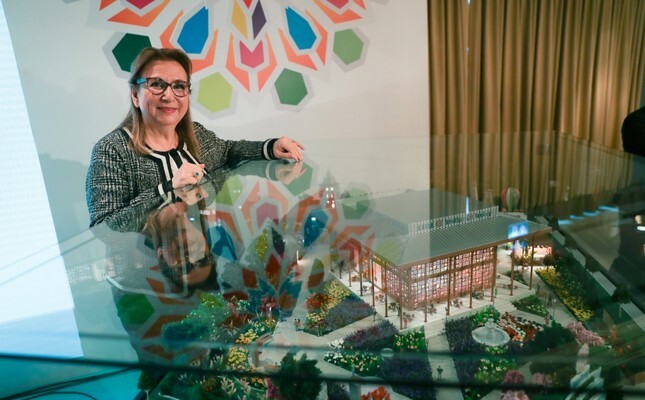 Trade Minister Ruhsar Pekcan stands by the model of the Turkish pavilion to be installed at this year's Beijing International Horticultural Exhibition, April 12, 2019. Turkey, which hosted the 2016 World Botanic EXPO, one of the largest horticultural shows in the world, in the Mediterranean resort city of Antalya, is now preparing for the Beijing EXPO 2019, also known as the International Horticultural Exhibition. Set to open on April 29 at the foot of the Great Wall in Beijing's Yanqing district, the event, which lasts for 162 days until October, is expected to host over 100 countries and international organizations and around 16 million visitors. Prior to the expo, Trade Minister Ruhsar Pekcan met with press members in Istanbul and discussed the preparations and goals the country has set for the event. Addressing the meeting, Pekcan noted the importance they attach to such events, stressing that they strive to take part in all international platforms to promote Turkey's deep-rooted history, its culture. "The role of being a determinant in the global economy goes through promotion and perception. In particular, as has been witnessed recently, how strong the country is perceived is as important as how strong the country is. And we are managing our works in this direction," Pekcan stressed. Turkey will have a major presence at one of the biggest pavilions in the 2019 Beijing EXPO on an area of 2,400 square meters. The Turkey exhibition will be themed Embrace the Future with Green, to reflect the will of the country to take a leading role for a greener, more livable and sustainable world. In this respect, the Turkish pavilion has been designed to reflect Anatolia's unique natural life and respect for nature in accordance with both the overall expo theme, Live Green, Live Better and Turkey's own theme. "We believe that taking part in expos will benefit the more effective announcement of the economic and political achievements, works and efforts of our country. Expos are areas where country experiences are shared and that increases cooperation," said the trade minister. Pekcan said that Turkey also wants to leave a mark at the expo and give a message to the world, noting that Turkey has taken a strong place in the organization to "share our work in the framework of the responsibility we undertake." In her remarks, Trade Minister Pekcan also touched upon the expo in Antalya in 2016, indicating that China showed broad participation and made a significant contribution to the historic and cultural relations of the two countries, as China presented its China Garden to Turkey. "While China has given us its garden as a gift, the projects we have done for 2019 have been highly appreciated by the organization in China, and they have requested that we make it permanent," Minister Pekcan said. "We will also be glad and honored to present our pavilion to China. We see EXPO 2019 Beijing as impressive proof of Turkey-China friendship, as well as an opportunity to introduce the quality and delicacies of Turkey and Turkish products to the whole world. Through the Turkey Promotion Group, we consider it an opportunity to promote all Turkish products from jewelry to hazelnuts and to olive oil." Adding that at various times and platforms, Turkey will organize, cultural events along with product introductions and tastings, Minister Pekcan said not only via products and goods but also by introducing Turkey, an atmosphere that will make a great contribution to the field of tourism has been created. "We will have the opportunity to introduce all the beauties of Turkey to our friends from China and other countries," she said. Indicating that as part of EXPO 2019 Beijing, each country is given one day to introduce itself in every field and to make its activities with all eyes turning to the country in question on that particular day. Pekcan said July 1 is Turkey's national day. "We also have nice preparations for that day such as folklore performances, whirling dervishes and demonstrations about Turkish art," she noted. "I hope we will find the best way to represent our country and find the opportunity to introduce Turkish products, Turkish quality, Turkish civilization and Turkish culture to the whole world." Inspired by the sultans' private gardens, the most beautiful examples of Turkish horticulture, the Turkish pavilion aims to reflect the nature-loving, free and yet harmonious structure of Turkish gardening. Bahçehane, designed with inspiration from Sultan Abdülaziz's hunting lodge as the main element of the pavilion, will be shown as a closed area to host guests. In the meantime, the Turkish pavilion will feature many important details such as the Endemic Plants Tunnel, which is one of the rare examples of rich plant diversity of the Anatolian region; the Innovation and Sustainability Area, which combines green and innovative works; and architectural structures designed to represent the seven regions of the country. While the structure in question has already attracted great attention, it will continue to be used as a permanent monument to Turkey's trade and promotion diplomacy in China based on the request of the expo administration. In addition to exhibiting the rich plant diversity of Anatolia, a promotional campaign will be carried out concerning Turkish culture and all products will have a "Made in Turkey" stamp in the Turkish pavilion supported by the relevant institutions and organizations. Coordinated by the Turkey Promotion Group, promoting prominent sectors of each region of the country will be taken care of by the Exporters' Associations at different time intervals for approximately six months.